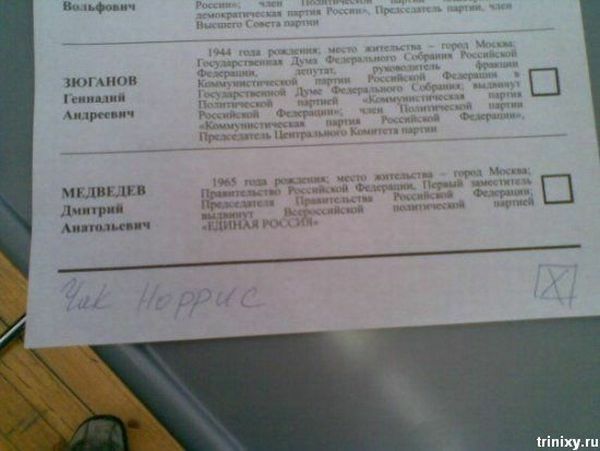 English Russia has a great post with many unconventional ways that Russians voted during the presidential elections. Apparently, Chuck Norris was a popular write-in candidate, even though his total votes were not reported in the news. This has the features of a Kremlin cover-up and I’m really surprised that Masha Lipman hasn’t broken this story yet. This entry was posted in Chuck Norris, elections. Bookmark the permalink.